Pre-construction conditions to resolve: Limited storage. Absence of adequate closet space and overhead lighting. Outdated kitchen and bathroom areas. A need for a bedroom and office. The clients came to us originally to create a bedroom with a walk-in closet. From there, a strong relationship developed that led to a complete overhaul of the loft. In the kitchen, we doubled its perceived size by incorporating what used to be a coat closet, a pantry and a mechanical closet by using face mounted doors in the same finish as the kitchen cabinetry and moving the fridge into the former coat closet. The coat closet was relocated to the entrance area as a stand-alone wardrobe. In the bedroom, we were able to create a walk-in closet with 2 pocket door entrances by sectioning off a part of the bedroom with an oddly shaped column and running the closet along the perimeter of the sectioned area. In the bathroom, a bathtub area was converted into an all-glass shower with a sliding door. Suspended vanity and face mounted closet doors contribute into contemporary aesthetics of the room. 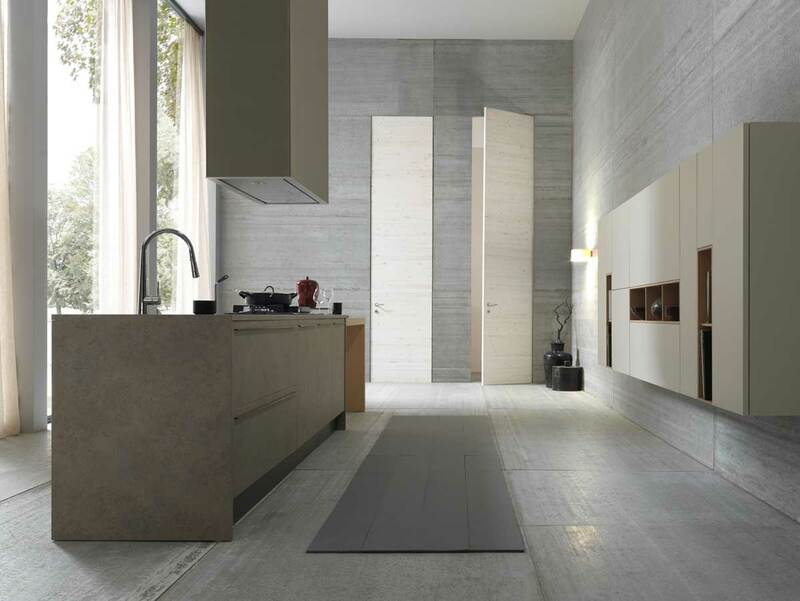 A state of the art Salvarani kitchen in combination of wood and lacquered cabinets. Caeserstone countertop. FEG wardrobe doors in matching lacquer are used for mechanical closet and pantries in the kitchen and for laundry and storage rooms in the bathroom. Bosca Arredi glass structure that serves as a bedroom enclosure with a sliding door entrance. Matching glass pocket slider in the bathroom with privacy lock. Bosca Arredi matte lacquer pocket sliders in walk-in closet. FEG walk-in closet in wenge with suspended dressers and shelf lighting. Modulnova suspended wood veneered vanity with stone counter top & integrated rectangular sink. Mirrors and vanity lights. Modulnova shower system comprised of tray, base, and glass enclosure with sliding door. De Majo glass lighting throughout. FEG entertainment center, dining room & living room furniture, as well as office components and entrance wardrobe. Pianca bed and floating night stands. What grew out of an initial conversation with Studio Verticale around bedroom possibilities is beyond what we could have imagined. As we moved from the bedroom buildout to the kitchen and bathroom renovation our loft became a visual representation of who we are. We always knew the space had potential and we needed Studio Verticale's vision, design expertise and product knowledge to turn our renovation from an update to a true work of art."